Roborovskis (Phodopus roborovskii; formerly, Cricetulus bedfordiae) or desert hamsters (also known simply as Robos) are the smallest of all hamsters, averaging under an inch (2 cm) at birth, and (rarely) three inches (7.5 cm) during adulthood. Distinguishing characteristics of the agouti Roborovskis are eyebrow-like white spots and the lack of any dorsal stripe (found on the other members of the Phodopus genus). 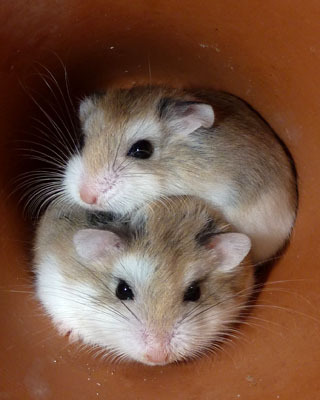 The average lifespan for the Roborovski hamster is three years, though this is dependent on living conditions (extremes being four years in captivity and two in the wild). As pets roborovskis can be a big challanged at first, requiring a lot of time and attention to tame them. However once tamed they do make very fun and lovely pets, they are not as loving towards their owners and prefer to interact with their own species so keeping Robos in pairs and groups is highly recommended. Being tiny most people assume they can be kept in small cages but Robos need a very large space to exericise, when keeping pairs/groups always follow the standard Keeping Pairs rules. Robos are not good pets for children as they do not like to be cuddled and few will stay still when being held. With no sense of hight they will jump from hands and dart off within seconds so these are pets for older teens and adults. They are by far the most entertaining hamsters to own and come in several colour - Agouti, white faced, husky, platinum, pure white, mottled/pied, headspot and locus brown - but only agoutis, white faced and huskies are recognised by the National Hamster Club.